Samsung's SGH-i200 makes no pretensions to be a top-of-the-range Windows Mobile device, but it is a nice little smartphone. It is a 3G device with a front-facing camera for video calling and a 2-megapixel back-facing camera for other shots. It is thin for the pocket, but a little on the tall side. The height could be a problem but it does mean there is plenty of room for a reasonable-sized keypad. The keypad area has a solid feel and, while there isn't a great return on the keys, there is nonetheless a very tactile feel to things. In fact, the general build of this smartphone is very solid. It should withstand a lot of knocks. Interestingly for a Windows Mobile smartphone without a QWERTY keyboard, Ofﬁce Mobile is pre-installed. You can use this to view PowerPoint presentations and edit Word and Excel documents, which might come to you as email attachments. The number pad is too ﬁddly for extended data entry and the 2.3-inch screen isn't large enough to view all but the shortest documents. Samsung doesn't bother to tell you how much memory is built into the SGH-i200 natively, but there is 20MB free for your own storage. This isn't very generous, but you can add to it easily as there is a microSD card slot on right side of the casing. 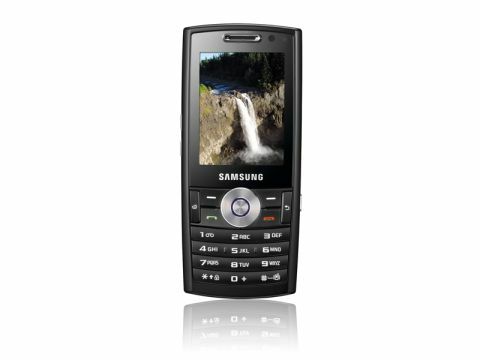 In the end, the Samsung SGH-i200 is a middle-of-the-road smartphone with HSDPA that should be long-lasting.